Looking for a wireless gaming keyboard mouse combo that not only performs great but looks the part as well? Well then you’ve got to see this gaming dynamic duo. E-More has done a great job creating a wireless keyboard and mouse combo. A slick keyboard and mouse layout combined with a modern look makes this pair one of the best, especially for its price point. There are many other keyboard and mouse combinations out there that are a lot more expensive than this! The 2.4GHz frequency will allow you to be about 10 meters away from the receiver before the keyboard and mouse loses connection which is a pretty good distance. Both the keyboard and the mouse share the same wireless receiver so that makes things a lot more convenient and you’ll have more USB slots to use for your other computer accessories as well. The mouse can switch between four different DPI settings which include 800 DPI, 1200 DPI and 1600 DPI which is a pretty decent amount. If you’re gaming on a monitor that has a higher resolution than 1080p then you should consider grabbing a different mouse that way it is completely optimal for your gaming experience but if you are gaming at 1080p then 1600 DPI will do just fine for you as far as gaming goes. This keyboard/mouse combo also comes in different color schemes such as red and black and white, blue and black. It’s entirely up to you to choose which color scheme you’d like but for me personally I really like the blue color scheme! Super slick and it’s really easy to see which buttons I need to use while gaming. Both the keyboard and the mouse takes two AAA batteries which are not included in the bundle. There isn’t any software to install and they both have an auto sleep mode therefore ensuring longer battery life while you’re not using them. The eight multi-media keys is a very nice feature! This combo is compatible not only with desktop computers but also laptops and Android TV’s as well so this combination is an all-around great buy. It’s ergonomic design will ensure complete comfortableness while using both the keyboard and the mouse. The keyboard has 8 multi-media keys as well that way you’ll be able to access all of your different means of media with the click of a button. 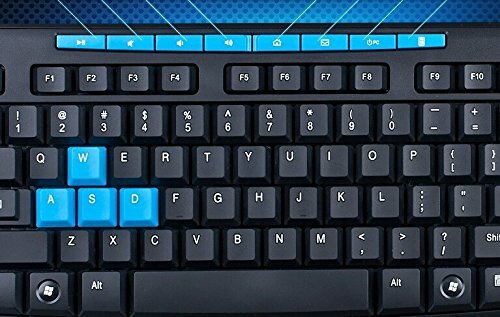 I really like how the WASD keys and the arrows keys are painted a bright blue. Although the keyboard is not backlit you’ll still be able to tell which keys you will need to use when you’re playing your favorite games. This is crucial because you don’t want to accidentally have your fingers in the wrong positions of the keyboard right when you start in a new match especially in multiplayer games when your team is depending on you as well! 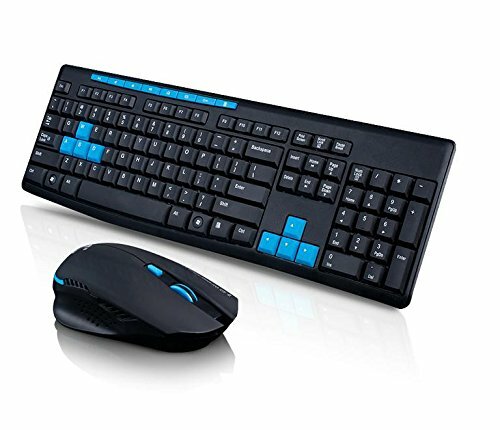 Other wireless keyboard/mouse combos like the Logitech MK710 Wireless Desktop Mouse and Keyboard Combo or the HAWKPECK 2.4Ghz Wireless Combo are just over priced or lower in quality. This combo that I’m reviewing gives you the most bang for your buck when it comes to this wireless category. All in all this is a great wireless gaming keyboard mouse combo and your money is very well spent with this combination. Is wireless the way to go or do you prefer wired? Tagged best gaming mouse and keyboard, keyboard mouse combo, wireless gaming keyboard, wireless gaming mouse, wireless keyboard, wireless keyboard mouse combo, wireless mouse. Bookmark the permalink. Indeed, Tony! Great performance for its price point! You give good information about where to get PCs built on a budget and give people good places to go in order to do so. Nice Job! Thanks Michael! 😀 I appreciate the kind words! Wow, this gaming keyboard looks good. Especially the highlighted WASD buttons. Perfect for games that use that for directional controls. Good find man. Indeed the keyboard is great for gaming and the mouse matches it as well both with performance and looks! I really enjoyed your post as I found it both informative and entertaining. It seems to me that wireless is the way to go. Most definitely, Tom! Wireless just makes things easier! Do these work differently with different game platforms or computer setups? Works all the same with all platforms that run Windows – Laptops, desktops etc. and these will also work with Android based TVs! Awesome website and awesome post. I love PC gaming and didn’t know you could obtain a mouse and keyboard of this quality at such a cheap price. Keep up the great work you are a writer with a keen ability for writing the important details. It’s amazing how many computer essentials are out there for a low price! Thank you for the kind words Shawn! Hey Colton, this is awesome. I love the way the gaming keys stand out and the slick design. Exceptional value for money also, thanks. No problem, Jason! The keys feel great! Is there ever any problem with missed keystrokes/etc when using a wireless keyboard? I’ve considered getting one before but I’ve always worried about that.